Frigidaire continues to work on providing quality electronic appliances for the kitchen and into the laundry room, with its ATF6700 series of front loader washers. These machines are designed with outstanding efficiency that makes Frigidaire a leading name in the household appliance industry. With the Frigidaire ATF6700, users can have more than just cleaner laundry, but peace of mind as well. 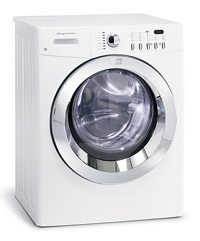 The Frigidaire ATF6700 is a washer that is built to fit into the modern lifestyle seamlessly. Free-standing, hidden in a closet, or up on a pedestal, this washer blends in and stands out perfectly because of its modern and sleek designs that mirror the technology used in the machine. No matter how heavy the load, the washer remains whisper-quiet during cycles, allowing one to concentrate on other things while doing the laundry. These frontloaders are also efficient washers, as the spacious tub allows one to wash as much as two baskets in one run, saving time, effort, and even moeny. Front loaders are also the rage these days. It helps save on space and can be placed in closets or under cabinets. One can use the space on top for detergent and other accessories for laundering. The secret to the Frigidaire ATF6700's cleaning capacity is that it washes and rinses clothes with clean water first to wash out stains and dirt. Stains and dirt can be more effectively removed as the Frigidaire ATF6700 analyzes each load to customize water levels, detergent amount, and even energy usage for better stain removal. Seven kinds of wash cycles are also available, allowing users to choose which is more suitable for the type of fabrics to be washed. This prevents clothes from tangling together as in traditional agitator washers. Fabrics are also taken care of as the gentle tumbling motions effectively clean and rinse clothes without stressing or damaging the fibers. This gentle tumbling motion, however, operates at 1,050 rpm speed that effectively cleans the laundry. The Frigidaire ATF6700 is also particular with water temperatures used in washing different types of fabrics. The washer can be set according to different types of fabrics; the washer will automatically regulate the temperature to better clean the laundry items without damaging the color and strength. There are five temperature settings to better suit whatever type of fabric will be washed. A secure door seal effectively keeps in the laundry and water in the machine to prevent leaks. Users can better regulate the wash cycles with the control dial, while the LED display can show the time remaining in one cycle as well as the kind of cycles used. The Frigidaire ATF6700 is energy-efficient, hence, earth-friendly. Water, detergent, and energy usage are reduced to help save on costs as well as lessen any harmful impact on the environment. Practically anyone can benefit from using the Frigidaire ATF6700 model because it is very efficient when it comes to cleaning. Based on customer feedback, this kind of front loader washer is perfect for people who are always on the go, as the automated settings can be easily set, with less need for constant supervision of the laundering process. Its whisper-quiet feature also makes it even preferable for use even if installed in small spaces. This particular model from Frigidaire is only a washer. Customers have mentioned that a separate dryer unit needs to be purchased. Also, the price may be a little bit steep for a single washer unit, but is relatively cheaper compared to washing machines from other brands. The Frigidaire ATF6700 is an impressive line of washer that any user could definitely use with ease. It can meet the demands of different laundry needs. From washing fragile silk pajamas to laundering heavy drapes, the 3.5 cubic foot tub can do the ultimate cleaning without damaging the fabric. Its rinsing and spinning cycle takes out a large amount of moisture from the washed clothes, taking up lesser drying time whether in a dryer or from a clothes line. It's efficient, saving not only on operating costs, but also in space.